The shield volcano Olympus Mons on Mars has the distinction of being the most massive single volcano in the solar system - this volcano, according to NASA, is 25km high with a diameter of over 600km - with a base that would cover the American state of Arizona (as in the image below). 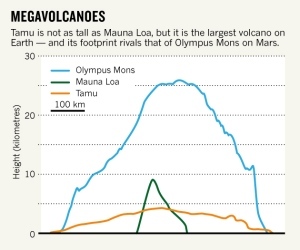 What evidence, if any, has been found to prove that there ever has been a volcano the size of Olympus Mons on Earth? Recent studies have recognised what could be the most massive volcano in the world, a geological feature already known, but was not recognised until recently as being a single volcano. 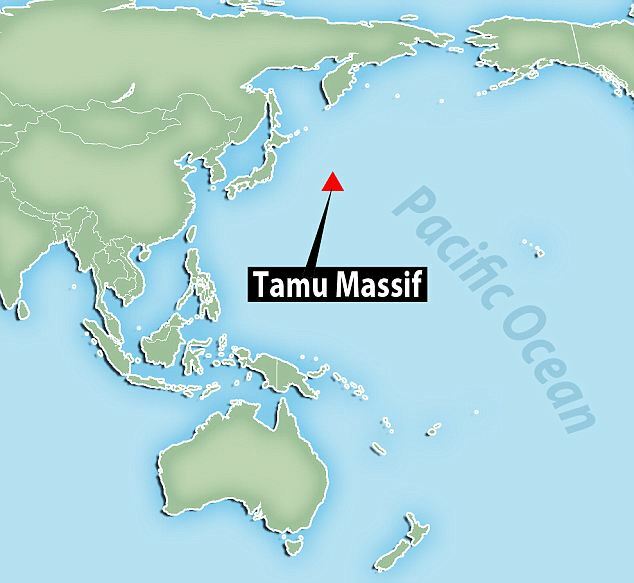 It is the Tamu Massif in the north-west Pacific (location map shown below), what was thought to be one of the vents of the Shatsky Rise - but recent seismic studies, reported in the article An immense shield volcano within the Shatsky Rise oceanic plateau, northwest Pacific Ocean (Sager et al. 2013) have revealed that it is one single shield volcano. The Geology.com article states that it covers an area of approximately 310,800 square kilometers (120,000 square miles), about "the size of New Mexico" - and, according to Sager et al., making it comparable with the size of Olympus Mons. The authors hint that seismic studies could well find more shield volcanoes on a par or even more massive than Olympus Mons. Of course, as they state, the identification of Tamu Massif as a Olympus Mons sized megavolcano suggests that there have been more such megavolcanoes in Earth's early history, most of course would be eroded, lost to tectonic processes etc. Will a volcano erupt in Australia soon? Why does Volcano Lightning occur? What is the origin of the Laacher See caldera magma in Germany? What conditions could produce 50 km long lava tubes? Why exactly is the feature on Io called a volcano, and the feature on Enceladus called a geyser?